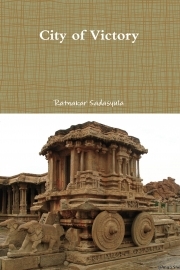 Description of "City of Victory"
In the year 1336 AD, two brothers Harihara and Bukka Raya, founded a kingdom on the banks of the Tungabhadra River at a place called Hampi. Over the next 3 centuries, it would grow to become one of the mightiest empires in the world, the Vijayanagara Empire. An empire dazzling in it's achievements, in it's riches, in it's arts. From it's founding, to it's fall after the Battle of Tallikota to the heights it achieved under Sri Krishna Deva Raya, City of Victory aims to recreate the splendor and glory of one of the most magnificent empires ever. Ratnakar Sadasyula is an IT professional from Hyderabad, with interests in history, movies, music. He is passionate about Indian history, culture and mythology. He believes that knowledge is something that stays for ever. Reviews of "City of Victory"